The planned complex would offset its energy consumption by generating its own electricity onsite, the developer said. 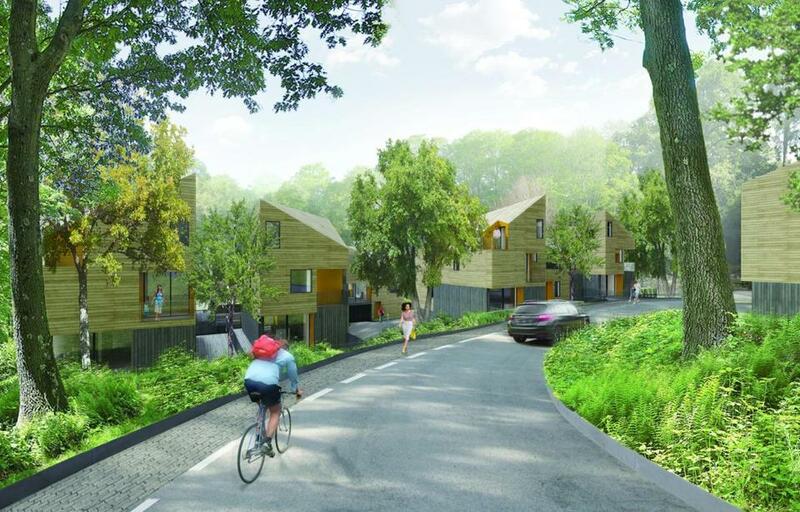 A controversial project to build 18 luxury town houses near Faulkner Hospital in West Roxbury received unanimous approval from the Boston Zoning Board of Appeals Tuesday. The proposal had become a flashpoint for a group of residents, who say it would overwhelm a quiet, woodsy neighborhood near the border of Jamaica Plain and Brookline, and the Walsh administration, which backed it because of its environmental aspects. The developer, Jacqueline Nunez, principal of WonderGroup, said the homes would be the first “net-zero” residential complex in Boston — meaning the complex will offset its energy consumption by generating its own electricity on site. The 2-acre property was zoned for single-family use and is tucked into an unusual pocket that includes the 86-acre Allandale Woods conservation land, open space, and Allandale Farm. Putting so many town houses on the property required dozens of zoning variances, and neighbors and residents of the nearby Springhouse retirement community argued the project’s potential benefits were not worth threatening Allandale Woods and upending the rules that govern building in the area. Representatives of several City Council members testified against the project, but it has strong support from Mayor Martin J. Walsh and the Boston Planning & Development Agency. A BPDA staffer said the project “aims to be a national model for sustainability” and noted that Nunez’s group has agreed to contribute $50,000 for upkeep of Allandale Woods. Opponents have also highlighted the project’s high costs. Nunez said it will cost at least $1 million per unit just to build. That, critics say, would put the town houses far out of reach for the middle-class Bostonians for whom Walsh says he wants to build more housing. But Nunez said Boston needs more housing at all price points. She has scaled back the project by two units to appease neighbors and said that nothing built in the area would sell for less than $1 million each. The project still needs final design approval from the BPDA. Once that’s in hand, Nunez said, she hopes to start construction next fall. Some neighborhood groups are considering a lawsuit against the project, said Tony LaCasse, a Roslindale resident who is involved in the effort.